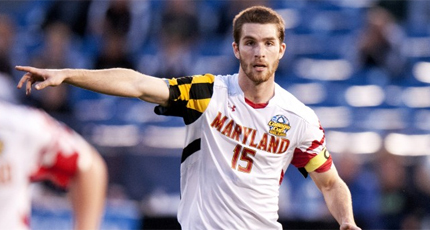 For the past five years I've put together a top 100 MLS draft prospect list. Of all the projects I do, this one grabs the most interest from the average fan. I believe this is partly because as North American sports fans we expect this type of analysis, and other than a few independent outlets, and a small effort by the official MLS website, not much work is being done in this capacity. As a writer I don't produce material to attract readers, but rather try to give insight that I feel is being ignored and in the case of the MLS draft, in my opinion, is not only ignored by the media but also the MLS and individual scouting departments as well. 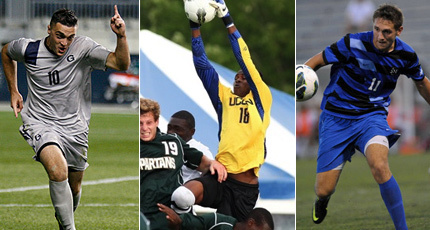 Last season I did some writing regarding the 2013 MLS draft prospect listright before the combine, where I talked highly regarding players such as Carlos Alvarez, DeShorn Brown, Andrew Farrell, Dillion Powers and Walker Zimmerman. I also expressed concerns towards Erik Hurtado, and of course the Toronto FC duo of Kyler Bekker and Emery Welshman. With the American college and Canadian CIS soccer seasons beginning this week I put together my preseason top 100 list. I update this 3 or 4 times throughout the College as certain players excel and other fall off and I hope to write articles in the future as the this season develops. Here, in my view, are the profiles of the top ten seniors to watch, five underclassmen who would have to qualify for a GA or Homegrown spot to be eligible, and five interesting stories including two Canadian players. The complete list I produce comes with analysis on each player including exclusive statistics and ranking from 1 to 100. If you want more information regarding the complete you can email or tweet me. 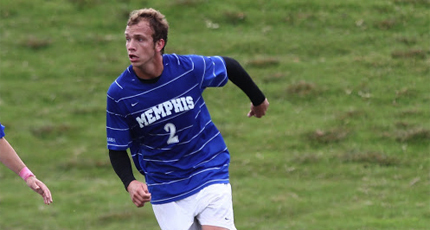 Neumann's statistics are incredible, scoring 31 goals and 20 assists in 64 college games. Regarded as an attacking midfielder, although he may play winger in MLS, and is known for his goals from outside the box with 12, including 3 direct free kicks. The statistic that impresses me the most was his ability to get 42 shots on target last season from the midfield. If Neumann can repeat the same statistical output this season he would be my number one pick. 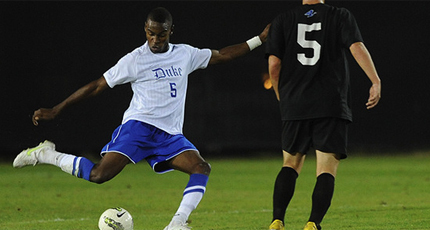 If it wasn't for a disappointing season last year for Duke, Sebastien Ibeagha would have been a GA or joined the Houston Dynamo as a Homegrown player. Ibeagha is an athletic defender either playing Centre Back or Defencive Midfield. Coming in at 6'1/179 should allow him to play CB, although MLS teams might want to take advantage of his athleticism in the midfield. Statistically, Ibeagha scored 6 goals, 5 via headers in 44 career games and knowing Duke tradition of allowing players to play different positions, I wouldn't be surprised if the offensive numbers improve this season. It's hard to imagine labeling a player scoring 12 goals in 18 games as a disappointment, but after scoring 19 goals in 18 games the previous season, Mark Sherrod's draft value went down especially in gaining himself a GA contract. Although the 6'3/185 forward has great size, has scored 35 goals in 53 college games and has also scored a number of goals over the summers in PDL play with the Portland U23 team. Expect Sherrod to score double digit goals this season and potentially be a high draft pick or a Timbers homegrown player. Patirck Mullins had a sensational season in 2012 scoring 17 goals and adding 8 assists in 24 games, surprising many that he didn't get a GA contract last year. Overall the 6'1/172 forward has scored 28 goals in 66 games scoring both with his head and outside the box. However, personally I have some concerns over his MLS capabilities since Mullins fits the classic college winger position that has failed to be effective or find a role in the professional game. If Mullins has a season comparable to last he will be highly touted in the 2014 draft. Highly regarded during his entire college career, Kyle Venter might be the best defending prospect in the upcoming draft. 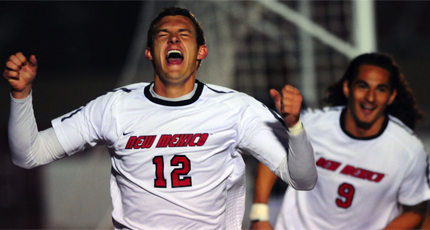 The classic 6'3/190 Centre Back has had a very successful career with New Mexico scoring 7 goals in 64 games, admittedly against weaker opposition than other potential draft picks. Venter, who redshirted his first season, will be 23 by the time next season begins and is expected to be one of the most pro-ready players in the draft. At midseason last year Jared Watts was perceived to be a potential GA pick and someone who I mentioned Toronto FC could draft with one of their picks. The 6'1 box-to-box player influences the midfield, including performing some hard tackles, which led to two red cards in 2011. 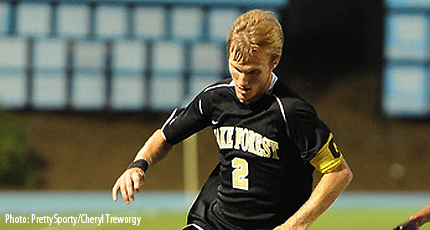 Wake Forest had a disappointing end to the season in 2012, including a 1st round exit in the tournament, so Watts returns back for his senior season. Wake Forest seems like a contender this year and if they do go far Watts style of play will make him stand out, which could lead to a high pick. Corrodo is ranked by many as the top returning player from an Indiana team who won the national championship last season. He is a speedy midfield/winger who is also known for his crossing and corner kicks. However, he has not been a standout his whole college career. In 2010, Corrodo failed to impress at SMU and after transferring to Indiana spent most of 2011 coming off the bench. Indiana seem to be weaker this season, and without the extra profile of a championship run or achieving huge assist numbers Corrodo's ranking could drop. 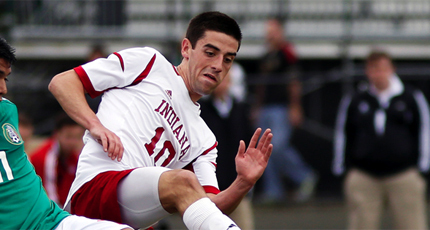 After a successful season in 2009 with Bradley, Aodhan Quinn transferred to the soccer powerhouse of Akron in 2010. In his first season with Akron, the 6'0 Midfielder played a useful role starting all 23 games scoring 3 goals and 7 assists. 2012 could be regarded as a disappointment being overshadowed by fellow midfielder Scott Caldwell. Caldwell is now in MLS, so expect Quinn numbers to improve especially being in charge of many set play opportunities. However, like Kyle Bekker's issues this season, the jury is still out regarding college attacking midfielders and their ability to perform at an MLS level. I'm quite high on Lovejoy after being a key contributer to UNC 2011 national championship. He also had successful PDL campaign before getting injured at the start of last season. He did manage to make a return scoring five goals in 11 games. Now fully fit, I could see him scoring in the high teens or even 20 goals this season, which will put him on the national radar once again. That being said, there are still some concerns how a forward who weighs only 150 pounds will do at a pro level. I would also like to see him dominate teams at the college level including high shots on goal numbers before I consider him a top pick. 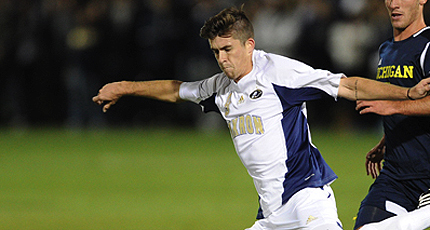 Lined up as a New York Red Bulls homegrown player, the question regarding Allen is how long he will remain in College? 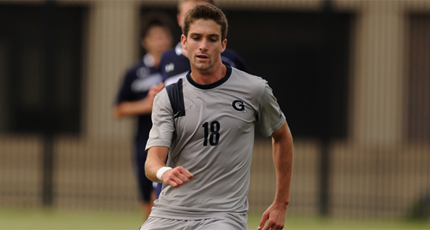 In his first season at Georgetown his 16 goals in 26 games helped lead the Hoyas to the National Championship game. Allen was a dominating figure, firing 45 shots on target and scoring the game winner in 10 games. Allen also scored a large number of goals in the Red Bulls academy program and was called up by the US national program for the U20 qualifiers playing in the 4-2 win over Canada. Regarded as the best Goalkeeping prospect in College soccer over the last two seasons, it's a bit of a surprise that the 6'4 Jamaican is still in College. Blake played in 47 career games, winning 35, allowing only 22 goals and shutting out his opponents 26 times. That being said, this season's goalkeeping prospects are much weaker than last years, so don't be surprised that Blake gets his GA contract before his senior season, if not a European club could take him away from MLS. The junior full-back has as much hype as anyone in college soccer. The fact he plays for a top college and also participated on youth US national teams means he's on everybody's radar, including MLS teams. I'll be honest, compared to others I don't rank him as highly. Okwounu does have great speed but is only 5'8, so isn't very versatile. He also hasn't shown any offensive ability with zero goals, assists or shots on target, but has played and started in every 47 game for UNC. Robbie Kristo is the type of prospect who I feel will produce in the MLS. Kristo is a 6'4/200 poward forward, so you basically know what you are going to get from him, although he's also performed. The Junior started his career on the bench but was a key player last season and has scored 17 goals in 35 career games with 49 shots on target. I expect his numbers to improve and wouldn't be surprised if he scores 15 to 20 goals this season. The question regarding GA is there might not be much European interest in him so the MLS might allow him to play his Senior season before offering a contract. Huitema should be the highest profile Canadian in NCAA soccer right now. The freshman is a Vancouver Whitecaps Homegrown player and should join the 1st team when the Whitecaps thinks he's ready. The 6'1/180 forward has scored almost a goal a game with the Whitecaps U16 and U18 development teams. Joining Duke will give Huitema an even higher profile and should be called up by the Canadian U20 team in the near future. He would have to have an exceptional season this college campaign to be in the MLS next year. According to my top 100 list, Jordan Ongaro is my top Canadian Senior in College soccer this season, although I don't have much hope in him making an impact at the pro-level. The 21 year old striker/winger has played for the Canadian U-17 team and was part of the players pool for the Canadian U-20 team. During his college career, Ongaro has scored 12 goals in 57 games and has shown a steady progress, although not comparable to other players in draft especially at his position. Ongaro will need to improve greatly to be highly drafted, but should get a tryout by a Canadian MLS side just because the lack of Canadian talent. Wickham is in my view the second best Canadian senior, and actually transferred from a Canadian University Trinity Western to NCAA D1 school in UAB. It is interesting to see that his stats from the transition has been seamless and he has made a greater impact on his team at UAB than he did at Trinity Western, which raises the question of quality levels between each system. That being said, like Ongaro, Wickham isn't ranked high in my list and other than being Canadian would have a difficult time being noticed, drafted and eventually playing in the MLS. 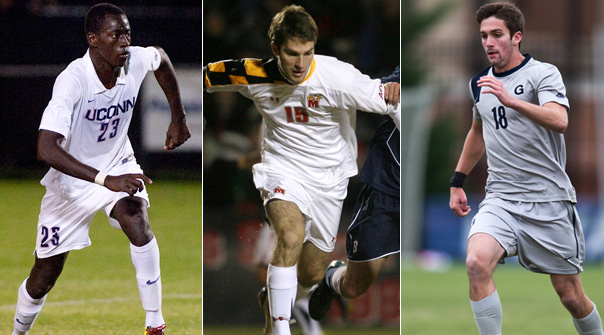 NCAA Soccer does recruit many foreign players from around the World and as you can imagine, based on the development system they grew up in, they tend to shine at the NCAA level. 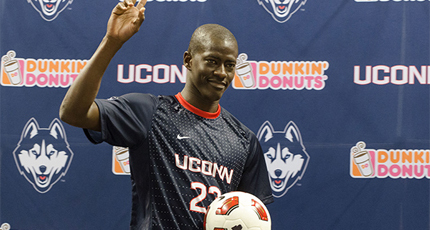 Behind Mamadiou Diouf, Ricardo Brenes might be the second highest profile foreign player in the draft. The Costa Rican Senior scored 11 goals with Akron last season, and in some ways is replacing the graduated Darren Mattocks as the Zips scoring threat. With a good season this year he could go high in the draft especially if his former coach Caleb Porter has a say when Portland is on the clock. To me Pedro Ribeiro is a very interesting prospect. The Brazilian midfielder has 20 goals and 17 assists in 63 career games, although the most impressive stat to me is his size. The attacking midfielder is listed at 6'3 and weighing 208 pounds, and if you watch him play you see him dominating his opponents with his size. As soccer develops in America I believe athleticism, including size, is what will give the American based player their competitive advantage in the game. Ribeiro does lack speed and will cost MLS teams a foreign slot, but it be interesting to see what he can do in the pro game. 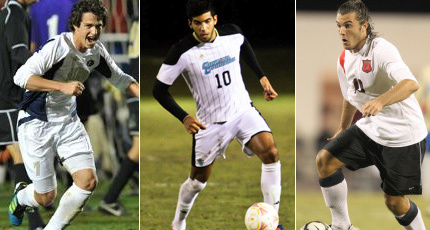 Alex Martinez is the younger brother to former GA pick and MLS disappointment Enzo Martinez. 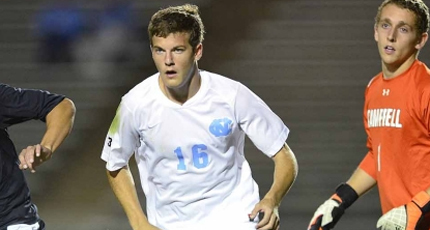 Enzo was the key offensive contributor to UNC national title win which lead to much hype in the 2012 MLS draft. A lack of size and being listed as foreign player has meant Enzo has yet to play in his first MLS game. Alex didn't start off with the same hype as his brother, but after two successful seasons at High Point has transferred to NC State and is expected to be one the top players offensively in college this season. It will be interesting to see how Alex is tracked this season in terms of the draft with the history of his brother.